Seasons are four separate time divisions of the year marked by different weather, temperature and day lengths. 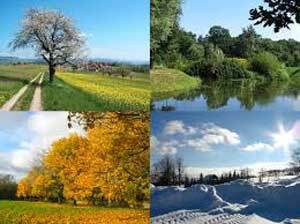 The four seasons are Spring, Summer, Autumn, and Winter. Seasons are created by the earths yearly orbit (365.25 days) around the sun and the tilt of the earth's axis (23.5 degree tilt) as it orbits around the sun. The seasons are opposite of one another in the Northern vs the Southern Hemisphere. Depending on how far north or south your are in each Hemisphere will determine how severe the weather, temperature, and length of day will be. Meteorological seasons were created to simplify the seasons into 3 month periods as shown below in the table. Astronomical seasons are used by astronomers and use the dates of equinoxes and solstices to define the start and end of seasons. Equinoxes and solstices are determined by both the tilt of the earths axis and where the earth is in its orbit around the sun. Gregorian Calendar - explains calendar system used for this site. Leap Year - details on leap year. Daylight Saving Time - details about DST.